Found exclusively in human-modified habitat, especially urban and public gardens in litter and under rocks and rotting logs; also in damp places in well-treed gardens. Under very wet conditions may be encountered crawling on pathways and up the sides of buildings. Introduced into north Queensland from New Guinea. Transported around the Pacific with cultivated plants. Feeds on native and introduced snails and other litter fauna. Introduced to some Pacific Islands to control the Giant African snail pest. It is in the top 100 of the worst invasive species and is seriously threatening endemic snail species in some Pacific island nations. Length 4-5 cm. 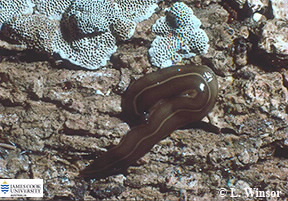 Broad, tapered at each end; upper surface olive-brown with thin cream stripes along the middle and sides where brown fades to the cream belly. Head grayish, with two prominent eyes either side of a snout-like tip.